Thanks to large national coffee chains, we've all become familiar with the term latte and think of it as a coffee drink with lots of milk. But what, exactly, is a turmeric latte? Is it coffee, tea, or something else entirely? 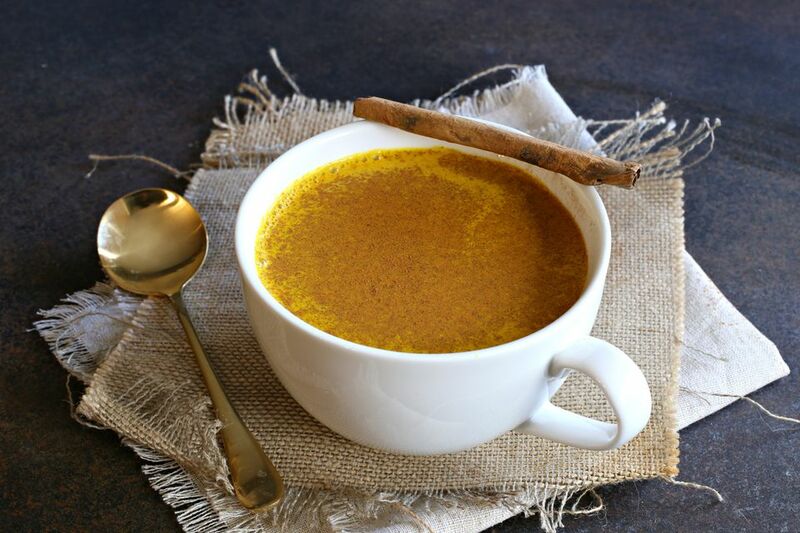 Quite simply, a turmeric latte—occasionally listed as golden milk—is a milk-based beverage flavored with its namesake yellow root, natural sweeteners, and other aromatic spices. In other words, it isn't actually a coffee drink and won't give you that much-needed morning buzz. It is, however, a warming and nourishing drink that may offer certain health benefits. Some studies claim that the curcumin found in turmeric is an antioxidant and has anti-inflammatory properties. In fact, the reason that this drink often includes black pepper and fat, such as ghee, is because those are thought to help the body absorb curcumin. Fresh turmeric is part of the ginger family and native to Southeast Asia. Just like ginger, turmeric can be grated fresh and used in cooking, but it's also available as a powder that can be found at most grocery stores. The deep yellow-orange hue of turmeric is often used to color foods such as curries or for dying fabrics. In fact, it's a good idea to be careful when you cook with turmeric because it will stain. Turmeric has a warm, mild and slightly earthy, slightly bitter flavor. It's mostly an ingredient in savory recipes in South Asian, Indian, Moroccan, and Middle Eastern cuisine. The common Middle Eastern spice mix, ras el hanout, usually includes turmeric. In some ethnic markets, you might find turmeric lattes sold pre-made, possibly under its Hindi name, haldi doodh. The pre-made beverages almost always uses non-dairy milk. Fortunately, it's very easy to make this drink at home with a few simple ingredients. You'll need your choice of milk, ground turmeric, a natural sweetener such as honey or maple syrup, and some additional warming spices such as cinnamon and cardamom. In just a few minutes, a steamy cup golden milk will be ready. You can also easily make this latte vegan by using almond milk or unsweetened coconut milk. Regardless of its health potential, a turmeric latte is still a warm and cozy coffee alternative to start your day. Add the milk to a small pot along with the honey or maple syrup, ground turmeric, cinnamon, cardamom, nutmeg, black pepper, and melted ghee, if using. Whisk all the ingredients together while bringing to a boil. Reduce the heat to low and continue simmering and whisking for 3 to 5 minutes until the mixture begins to reduce a bit and the spices incorporate into the milk. Pour into a mug and sprinkle with additional ground cinnamon if desired.